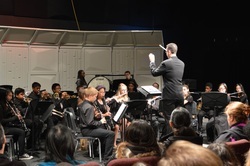 Katherine Albiani Middle School has a Beginning Band and a Concert Band program. Students from Albiani have the unique opportunity to play and perform with the Pleasant Grove High School Marching Band at football games and parades. Albiani students are also able to participate and perform with the high school students in the Jazz Band. Mr. Souliere is the music director for both schools. Select students from the middle school can participate in the annual band trip to Disneyland and march down Main Street with the high school marching band. Check out the Calendar for a more complete schedule of events. Videos of KAMS and PGHS band performances can be found on our YouTube site.